The culinary memoir has to be one of my favorite genres of both cookbooks and books in general. Combining anecdotes, family history and delicious recipes, and spanning literature and cuisine, there’s really nothing better than a cookbook that you can actually read, that’s not just a selection of quick and easy recipes by some personality-laden stand and stir TV show host, and from which you learn the context of the food and about why traditions and patience in food are important. 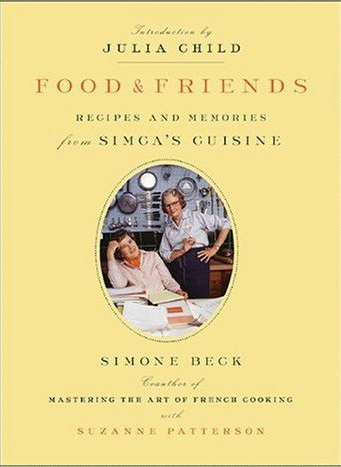 With the holiday season upon us, I can heartily recommend you give the gift of a copy of Food & Friends: Recipes and Memories from Simca’s Cuisine by Simone Beck, to your nearest and dearest this year. Madame Beck is best known as having been Julia Child’s collaborator on Mastering the Art of French Cooking volumes I and II, in which she was both originator and chief tester of the majority of the recipes contained therein. Beck and Child met through a mutual friend while Child was first in Paris with her spy-husband, Paul, in the late 1940s, and struck up a friendship that was to last until Beck’s death in 1991. In spite of her crucial role in these historic cookbooks, many Americans could be forgiven for never having heard of Simone Beck, since Julia Child’s television career and her bright and breezy personality are what most people remember. This is a pity because Beck is a superb raconteuse, whose life, spent in various parts of France, spanning two World Wars, a trans-Atlantic career, and the birth, life and death of nouvelle cuisine, is truly fascinating. The first half of this reissued book – first published in 1991 – is a charming, rose-tinted memoir, interspersed at key points with beautifully-constructed period menus complete with recipes from the principal events she tells of – dinners with local Norman families, dinners for liberating Canadian soldiers, and lunches made for her Provencal cooking school. The second half is rather more of a straight-up compendium of French recipes, many of which feel, in all honesty, rather old-fashioned and frumpy when deprived of Beck’s evocative descriptions of French country life we find in the first half of the book. If you are looking for a cookbook full of recipes that you’re immediately going to want to make, then this might not be the book for you, as although there are plenty of recipes that will make you salivate, many feel rather overly ornate for the typical American home cook. For the purposes of quality control, I tried her Poulet de Varvannes a l’estragon et a la creme (chicken in tarragon cream sauce) (recipe to follow in a later post), and found it to be not only completely delicious, but a very straightforward recipe to take on, even for a week night, so one can definitely pick through this books contents for more approachable dishes. However, even if you never make any of Simca’s food, there is plenty to enjoy in her book with its variety of delightful tales of her gastronomic pursuits and friendships with many of the 20th century’s most celebrated bon vivants. For further reading of this kind, I can also recommend Jacques Pepin’s The Apprentice, M.F.K. Fisher’s A Long Time Ago in France and the unsurpassed When French Women Cook by Madeleine Kamman. by Simone Beck with Suzanne Patterson, with an introduction by Julia Child. Penguin Books, 1991 (& 2010), paperback, black and white, 528 pages, $18. I’m with you on Madeline Kamman, an under-utiziled national treasure. Simca was charmingly portrayed in the Julie & Julia film and I have her Simca’s Cuisine… we just don’t cook like this anymore… and when you read it you wonder why??? ?